Having closed out our farmstand at Atwater and said good-bye to half our members as the regular season drew to a close at the end of October, suddenly our farm workload has lightened considerably. So much so that we even found a moment to attend our first winter concert at Place des Arts, a nostalgic tribute to an Algeria that is no longer. Meanwhile, back in Stanbridge East, winter Nor’easters have begun to blow, sweeping everything clean. 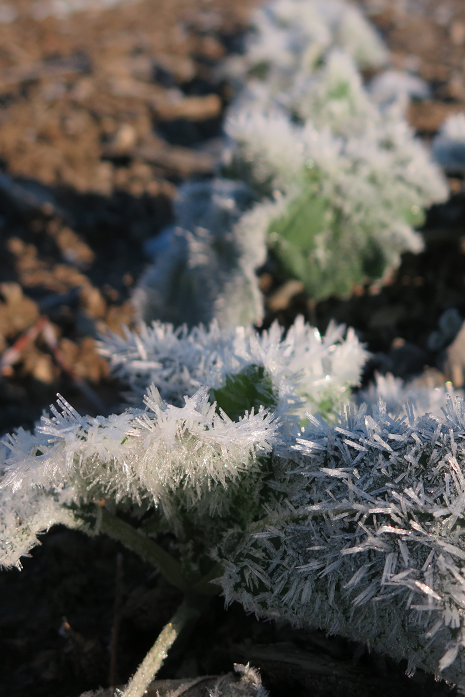 We’ve had our second hard frost, yet another reminder that leafy greens will not last forever in the field, despite their remarkable hardiness. We’re taking heed, and will be harvesting our mustard greens Monday, before the -4 degrees Celsius they’re forecasting in Montérégie. Be that as it may, the rest of our leafy greens are in the greenhouse, and should last a while longer. The country calm is not yet complete, as deer hunting season has begun. From dawn to dusk, the occasional shot rings out, although the exercise seems a bit pointless, as deer populations are dwindling. But the same instinct that drives Canadian geese south as soon as the weather turns seems to move hunters out into the November chill. They’re a strange breed, hunters. Modern Don Quijotes tilting after wildlife instead of windmills in their fluorescent jackets and camouflage vests, they find satisfaction shivering in the cold, waiting for that chance encounter with a young buck. One gets used to it, but fortunately, the season lasts a mere two weeks. Your second extended season basket is VEGETABLE, writ large : carrots, fennel, beets, Pak Choy, etc., but leafy greens, too – kale, Fun Jen mustard, arugula and spinach.